After Google, Sony is surely a company that provides the latest updates faster than any other company. But, it seems Sony has even beat the company that owns Android. Yes, we are talking about Google. What if we tell you that Sony devices are getting the Android update that even Pixel devices haven’t received? It’s been a day since February started and Sony has begun rolling out the February Security Patch for some of its phones. This time, even the Pixel phones haven’t got the update for the security patch, and this shows that Sony is one of those companies that aim to provide latest updates to its users. Do you own a Sony smartphone? Well, we will reveal which devices are going to receive this update so keep reading. READ: Android 7.1.2 Announced: Will Your Nexus Device Get it? 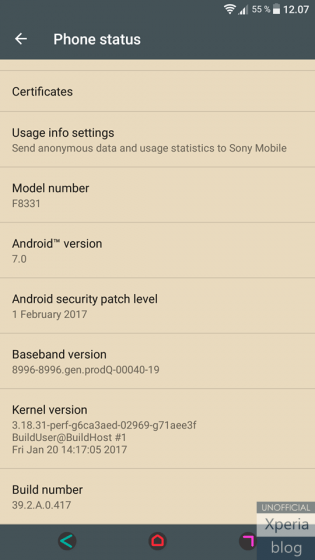 SONY PHONES THAT ARE GOING TO RECEIVE FEBRUARY SECURITY PATCH? The list is not big, and it includes only a few Sony device, which includes the high-end ones. It includes Sony Xperia XZ, X Performance, Xperia X or an X Compact. If you own one of those phones, then congrats because you will be one of the users that will get the February Security Patch and that too, quicker than Pixel phones. The update comes with the Build Number 39.2.A.0.417 with the date February 1st, 2017 for the Sony Xperia XZ and Z Performance. For Sony Xperia X and X Compact, it comes with the build number 34.2.A.0.311. One weird thing we noticed is the absence of Z5 which is surely one of the best smartphones from Sony that has already got Nougat update. We hope that the February Security Patch will be rolled out soon. As mentioned before, only few Sony devices have got this new update, and this new update comes with only some security hotfixes and not much stuff. What do you think? Wasn’t it pretty fast? Do let us know your opinions in the comments section. Well, seems amazing for Sony. But Google is Google and Sony is Sony.